Please be advised that more information will follow for each show on Facebook, Instagram and our Website! Please feel free to email us also at info@garysgemgarden.com. Thank you for your patronage! 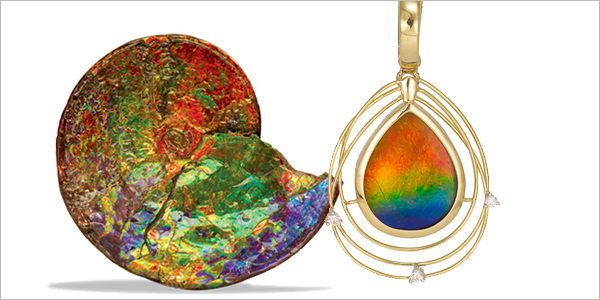 Ammolite’s luminous qualities rival the black opal for color and fire. Ammolite reflects a rainbow’s worth of colors (red, orange, yellow, blue, green, purple and more), and the luminous color spectrum in each gem is unique. Browse ammolite gemstone jewelry in our Jewelry Gallery. To date the only source of ammolite is in Alberta, Canada. Naturally, ammolite is a soft gemstone with a 3.5-4 on the Mohs Hardness Scale. A protective spinel crystal is often applied to protect the ammolite gem, increasing the hardness to 8.5. Ammolites are not generally treated. It’s all-natural color is its most distinctive feature. As with most gemstone jewelry, you want to minimize scratching and wear, so store each piece of fine jewelry separately in a soft cloth or padded container. Ammolite jewelry is best cleaned with warm, sudsy water and a tightly woven microfiber or other soft cloth. Most importantly, take all your fine jewelry to a professional jeweler, like a local Jewelers of America Member jewelry store, at least twice a year for a thorough cleaning and inspection. Garnet is the January birthstone and may be celebrated in its many varieties, providing an array of choices for gemstone enthusiasts. 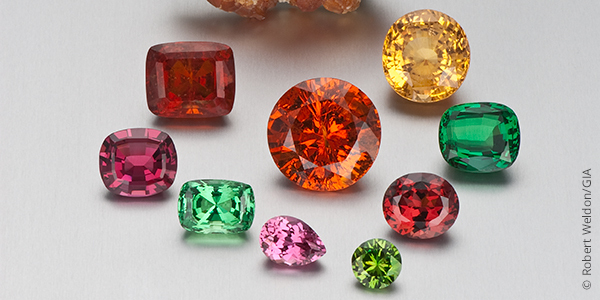 Garnet varieties and species come in a rainbow of colors, such as red, orange, yellow and green. Tsavorite (green) garnet was named for the region where it is mined near Tsavo National Park in Kenya. Yellowish orange to bright orange spessartine garnet is named after Spessart, Germany, where it was discovered. Russia is an important source for demantoid garnet. Other sources of garnet include Brazil, Tanzania, Sri Lanka, Madagascar, and the United States. Nature also produces “collector” garnets. Star garnets are found in India, the U.S. state of Idaho, and Sri Lanka; a rare form of iridescent andradite garnet is found in Mexico; and garnets that change color in different light are found in Kenya, Madagascar and Sri Lanka. Garnets have a hardness of 6.5-7.5 on the Mohs Hardness Scale. Garnets can be faceted or carved as cabochons or beads. Garnets are rarely treated because of their natural clarity and color. Any treatments should be disclosed to the buyer. Garnet jewelry is best cleaned with warm, sudsy water and a tightly woven microfiber or other soft cloth. Avoid steam cleaning. Our holiday hours are changing this year! One of the oldest and best preserved human mummies ever found is that of Ötzi, a man who lived some 5,300 years ago near the present border of Austria and Italy. His remains, preserved in an alpine glacier high in the Ötztal Alps, were found 1991. That Ötzi lived during the transition between the late Stone Age and the dawning Copper Age is evident from his possessions: a flint knife and a copper axe. Also among his possession were pieces of flint and pyrite, the key materials of early percussion fire making. Flint, hard and durable, was easily shaped into striking edges that could fragment pyrite or steel to create sparks. (Image courtesy iRocks.com) click here to read more about this. Anthropologists believe humans first created artificial fire between 250,000 and 700,000 years ago using simple drills in which wood-on-wood friction generated ignition heat. Much later, they learned to make fire by striking certain mineral materi­als with hard objects. The first mineral-sparking material was pyrite, or iron disulfide. The striking materi­al was flint, a form of microcrystalline quartz. Harder than pyrite, flint could be easily shaped into a striking edge. When flint strikes pyrite, part of the pyrite surface shatters and emits a shower of sparks, which can ignite dry tinder.